I purchased this rug along with the larger version. The colors were exactly what I had hoped they would be. The rug is soft and nice to walk on. The rug must be professionally clean or spot cleaned when necessary. Since I was going to use the smaller rug in front of a door, I returned it as it was not meant to be used to wipe your feet on it. I did, however, keep the 9 x 12 rug for my family room. It vacuums nicely, soft underfoot, and for the price I paid, it was a great purchase. 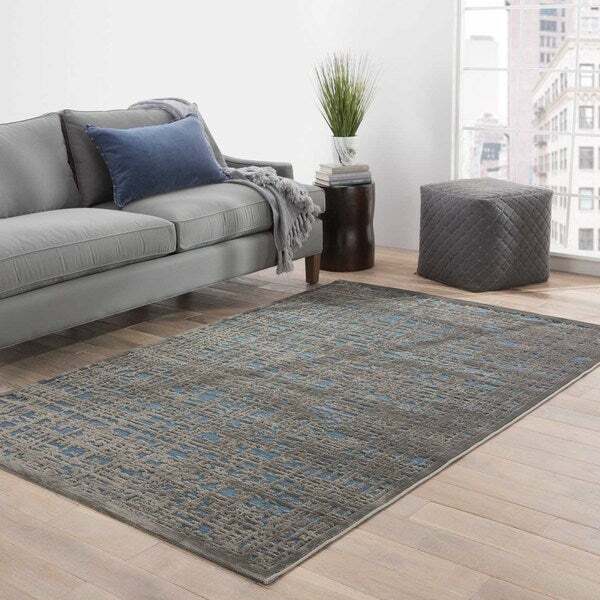 Echo Abstract Gray/ Silver Area Rug (9' X 12') - 8'10"x11'9"
Echo Abstract Gray/ Blue Area Rug (5' X 7'6") - 5'x7'6"
Soft to the touch and alluring with a distinctive high-low texture, this chenille area rug lends the perfect accent to bedrooms. A modern cross-hatched pattern adds dimensional appeal to this chic and lustrous dark gray and midnight blue layer. Love how simple the rug is. Have purchased a few of them and color/quality is as shown in pictures and great. Also ordered the large size in different print. Nourison Urban Chic Ivory Abstract Area Rug - 5'3" x 7'3"